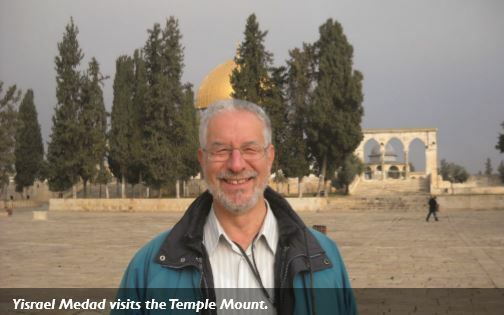 Political advisor, spokesperson, activist, author, journalist and blogger are just a few of the many hats Yisrael Medad has worn during his impressive fortyfive year career working for the people of Israel in the Land of Israel. Visiting his blog called “My Right Word”, you get a good sense of the kind of guy he is and the matters closest to his heart. He describes his blog by defining himself: “My thoughts, assertions and observations on issues important to me as a Jew, a Zionist, a Revenant in Yesha (Hebrew acronym for Judea and Samaria) and as an inquisitive human being.” As it were, he is as interesting as he is inquisitive. 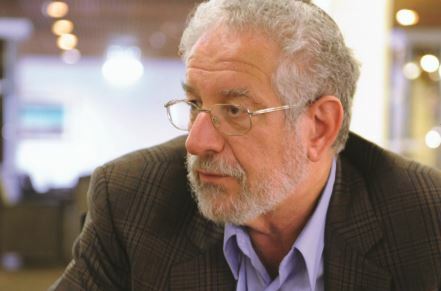 Yisrael’s resume is quite impressive and includes working as a political aide to Members of Knesset and a Minister (1981-1994), lecturing at the Academy for National Studies (1977-1994), and being director of Israel’s Media Watch (1995-2000). Medad currently works at the Menachem Begin Heritage Center in Jerusalem. Medad has also been a guest media columnist on media affairs for The Jerusalem Post, op-ed contributor to various journals, and even had a weekly media show on Arutz 7 radio (Israel National News) for six years. “I serve as an unofficial spokesperson for the Jewish Communities in Judea and Samaria” he says, although from the looks of it, he seems pretty official. Born in 1947 just one year prior to Israel’s establishment, Medad who goes by the nickname “Winkie”, was always aware of the importance of the State of Israel. Growing up in New York City, Medad was immersed in Israel advocacy from a young age. As a teenager he joined Betar, the Revisionist Zionist youth movement founded by Ze’ev Jabotinsky. After completing a Bachelor’s degree in Political Science at Yeshiva University, and marrying in 1970, he and his wife, Batya, moved to Israel. At first they lived in the Jewish Quarter of the Old City of Jerusalem which had just been reclaimed a few years before in the Six Day War. In 1981, Medad and his family moved to the Benjamin community of Shiloh where they raised their five children Chandi, Tzruya, She’era, Nedavya, and Aviah, and where they still live today. Yisrael describes their move as “a conscious decision to live in a place where no one could tell us we didn’t belong.” After all, the ancient city of Shiloh holds a central place in the Biblical history of the Jewish people. During the period between capturing the Land and building the Temple in Jerusalem, the Tabernacle resided in Shiloh, and during that time, Shiloh was the place of pilgrimage for the Children of Israel. Three times a year the faithful traveled to Shiloh to bring their festival offerings. The modern community of Shiloh had been established just a few short years prior to the Medads’ arrival there. Yisrael can still recall the above-ground plumbing and unpaved roads. Those were the years when Jews were just beginning to return to Samaria. The people who built these communities were starting from scratch; they were true pioneers, paving the way for their children and grandchildren. Today, like most of the communities that sprung up during this time, Shiloh is a lot more developed, and we have the original pioneers like Medad to thank for that. During the first years of resettlement, the people of Judea and Samaria were anxious to get the word out about the amazing developments taking place in the Biblical heartland. In 1988 the Yesha Council sought out a network of talented young professionals to volunteer doing Hasbara (Hebrew for Israel advocacy) for Judea and Samaria. Being who he is, it was obvious that Yisrael would take part. They created a task force that met to discuss public relations strategy for Judea and Samaria, arrange events and visits of prominent, influential individuals. It was through this network of people that Winkie met Sondra Oster Baras. 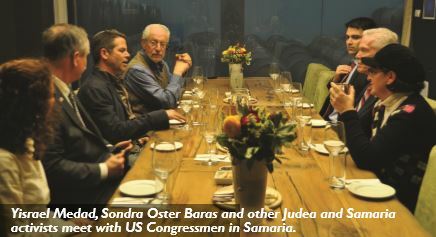 A few years later, this same group of people initiated a Jewish fundraising organization for Judea and Samaria because the mainstream Jewish philanthropies refused to donate to humanitarian projects across the pre-1967 lines. They invited Sondra to be the assistant director of that organization and Yisrael sat on the board, bringing them into regular contact. It was that organization, no longer in existence, that birthed CFOIC Heartland in 1995. In 1998, when Baras created the Israeli CFOIC Heartland non-profit, it was only natural that she would invite her friend Winkie to sit on the board. Over the years and thanks in part to CFOIC Heartland, Medad has met with Christian Zionists from all walks of life. “I feel very comfortable talking to Christians,” Yisrael affirms. 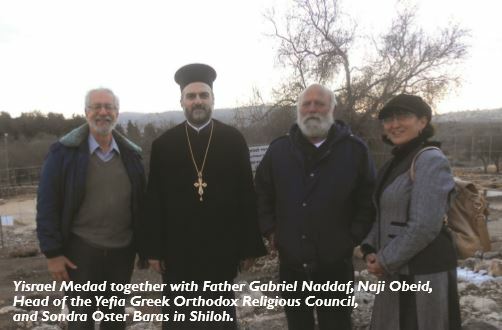 He has been featured on the “Prophecy Today” program, and most recently had the opportunity to guide Father Gabriel Naddaf at ancient Shiloh. Father Naddaf and Medad clicked instantly and at the conclusion of the tour, he told Medad: “Continue to dig for artifacts. Continue to discover history. You can’t imagine how moved I am today by what I see here. Everyone should come here and see these things for himself and be blessed by it forever. Be strong, and may God bless you.” May God continue to give Yisrael Medad the strength and passion to write, speak and advocate for Israel!